Today, Teresa Marrone and Walt Sturgeon share with us information about another prized delicacy, Cauliflower Mushrooms. 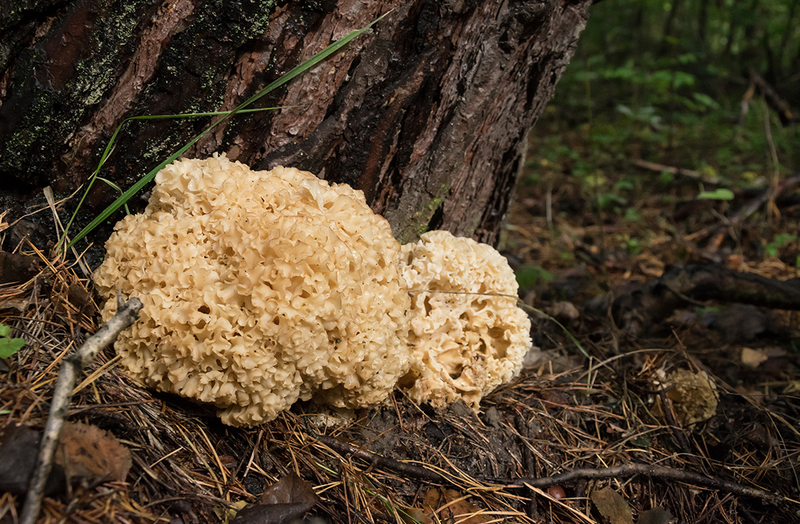 Many books show pictures of Cauliflower Mushroom (Sparassis spathulata, Sparassis americana) in a basket, on a plate, or displayed proudly in someone’s hands. The first reason is to show the impressive size that this mushroom reaches, but the second may be that hunters who find this delicacy aren’t willing to show anyone exactly where in the woods they found it! Cauliflower Mushrooms are saprobes, getting their nutrients from the buried roots of dying and dead trees. They’re found alone or in groups in mixed woods next to deciduous and coniferous trees. This large, brain-like cluster mushroom is easy to recognize. It is made up of a mass of creamy white- to tan-colored folds growing from a branching base. Some describe it as looking like a pile of egg noodles. Large examples may be up to 12 inches across, but most specimens are much smaller. This mushroom doesn’t have gills or teeth; instead, it has a smooth surface on one side of the folded flesh to release its spores. Two species are found in our area; both look similar and both are highly sought-after edibles. Sparassis spathulata is typically found under oaks. It has an underground central base but is not deeply rooted. Individual folds have distinct color zones or bands; the folds are spread out and fairly flat. 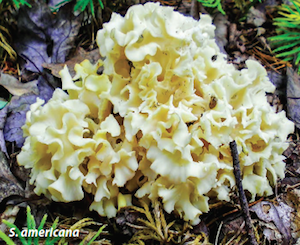 Sparassis americana, sometimes referred to as the Rooting Cauliflower Mushroom, prefers conifers. It grows from a deeply buried root that is dark brown to black; if the root is not disturbed, it will continue to fruit in the same place from year to year. Individual folds of Sparassis americana are very curly and uniformly colored, with no banding; they are more tightly packed together than the folds of Sparassis spathulata. Sparassis americana is less common in our area than Sparassis spathulata. The mushroom has a white- to cream-colored spore print and can be found summer through fall. The species is also known as Wood Cauliflower, Noodle Mushroom, and Eastern Cauliflower Mushroom. Sparassis radicata is sometimes listed as a synonym for Sparassis americana, but Sparassis radicata is actually a closely related species found in the Pacific Northwest and California. 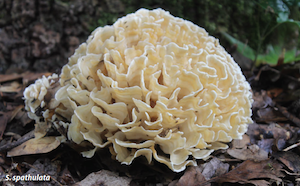 Sparassis crispa is listed as another name in some texts but is now thought to be a European species. Though not easy to find, the Cauliflower Mushroom is quite the treat! A large specimen, however, can require lots of cleaning. Though brittle, they can be pulled apart at the base and soaked in mild saltwater to remove debris and unwanted critters. When cooked, the flavor and texture of Cauliflower Mushrooms are often compared to buttered noodles. Older, overly mature specimens often have an unpleasant cabbage-like odor. Teresa Marronne and Walt Sturgeon, in their book Mushrooms of the Northeast: A Simple Guide to Common Mushrooms, feature hundreds of the most common species found in the Northeast.